As you know, we are a very small family business based in rural West Cornwall. However, we feel it would be rude not to join in with the madness of BLACK FRIDAY. Rather than make it too much of a hassle, we are offering a BLACK LONG WEEKEND! So..from now on Wednesday, 21st November until midnight on Sunday, 25th November, we are offering our FULL HOUSE for just £15 (the normal price is £27). 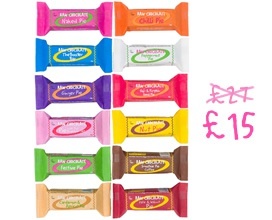 THE FULL HOUSE comprises our 12 most popular Raw Chocolate Pie bars. It comes in a gift box so makes a great Christmas present or why not just spoil yourself!